The TJ40G Rotary Jet Head tank-cleaning machine gets rid of residues while reducing cycle times and costs for energy, water and cleaning agents. 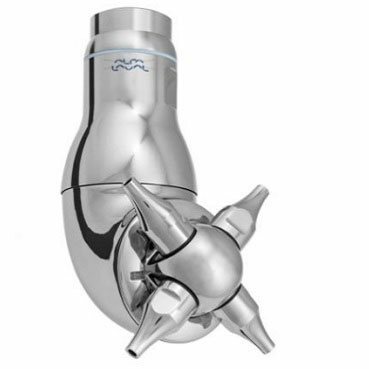 The latest innovation within the company’s broad tank cleaning portfolio, the Alfa Laval TJ40G raises the bar for tank cleaning performance of critical hygienic applications in the food, dairy, beverage,pharmaceutical, home and personal care industries. What’s new are an improved self-cleaning function of the interior and exterior of the device itself, and 100% coverage of tank interior. Like the Alfa Laval TJ20G, the Alfa Laval TJ40G uses a high-impact jet stream to effectively clean tough tank residues and minimize the risk of product contamination. This four-nozzle rotary jet head also cleans tanks 60% faster than static spray ball technology,which increases production uptime. And because it cleans faster, the Alfa Laval TJ40G uses less water and less cleaning agents thereby reducing operating costs by up to 70%. The eight-cycle cleaning pattern of the Alfa Laval TJ40G Rotary Jet Head gets successively denser as the cleaning cycle progresses,ensuring full coverage and thorough cleaning. Using the powerful mechanical impact of the jet stream to achieve outstanding cleaning results, the Alfa Laval TJ40G requires less time, energy, water and cleaning agents than comparable CIP methods. Not only does the Alfa Laval TJ40G Rotary Jet Head provide spotless cleaning of the tank interior, it also cleans itself – inside and out. Its hygienic self-cleaning construction ensures that the flow of the cleaning fluid reaches the external surfaces of the rotary jet head, as well as the critical internal components such as all bushings, bearings and inner surfaces. This minimizes the risk of product contamination and ensures a high product quality.